Mr Manoj V Parulekar is a Consultant Ophthalmologist at Nuffield Health The Manor Hospital, Oxford. He was appointed Consultant Ophthalmologist at the Oxford University Hospitals NHS Trust in 2016, and is also a consultant at the Birmingham Children’s Hospital since 2007. He graduated from University of Mumbai, India, with ophthalmology training in Oxford and Toronto. Mr Parulekar’s area of practice includes adult and childhood squints, and all aspects of children’s eye problems including eyelid problems in childhood. He provides a national service for childhood eye cancers, complex squints, and eyelid problems in children. Mr Parulekar has published widely in scientific journals and text books. He is a trustee of Sightsavers International, a charity dealing with prevention and treatment of blindness. 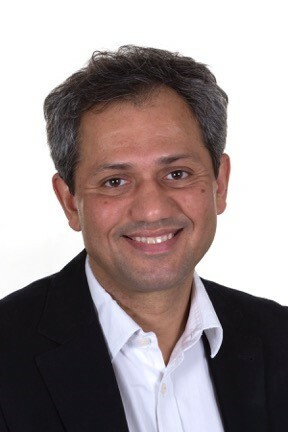 Mr Parulekar contributes actively to several professional bodies including the Royal College of Ophthalmologists (paediatric sub-committee, microsurgical faculty, scientific committee, and secretary to the annual College congress), the Oxford Ophthalmological Congress (treasurer) and several European boards. Mr Parulekar accepts referrals for all aspects of children’s eye problems, as well as adult squints and neuro-ophthamological problems, and sees UK as well as overseas patients in his practice. He also provides medico-legal consultations and reports. Complex eyelid/orbital and squint problems in children and adults- Mr Parulekar is one of the few specialists who deals with eyelid as well as eye muscle disorders. Mr Parulekar enjoys time with his family, and cycling and travelling. Mr Parulekar is ambidextrous, and has a major interest in left handedness- he is currently writing a book on the subject. Mr Parulekar is active in basic science and clinical research. He has been the recipient of several grants, including a prestigious Wellcome Trust Pathfinder grant. He collaborates with partners across Europe USA and India. His current research incudes stem cell research into childhood eye cancer, genetic studies on ocular fluid, new biomaterials for droopy eyelid surgery (ptosis), and spectral imaging of the eye. Mr Parulekar has over 40 peer reviewed journal publications, 14 book chapters, and has co-authored a textbook for medical students- Lecture Notes in Ophthalmology. Mr Parulekar travels widely and has delivered over 200 invited lectures, chairs seminars at British, American and World Congresses, and is actively involved in training residents, fellows and visiting doctors from the UK and abroad. Mr Manoj V Parulekar does not hold a share or financial interest in this hospital, another Nuffield Health hospital or the company. Mr Manoj V Parulekar does not have a share or financial interest in equipment used at this hospital or another Nuffield Health hospital. Mr Manoj V Parulekar does not hold any paid advisory role(s) at this hospital or on behalf of Nuffield Health.